Dumbo the Flying Elephant Fantasyland attraction at Disneyland, opened August 16, 1955. Also known as Dumbo Flying Elephants (1959-83) and Dumbo’s Flying Elephants (1983-84). Riders fly in Dumbo-shaped vehicles, and are able to control the up-and-down movement by way of a lever. 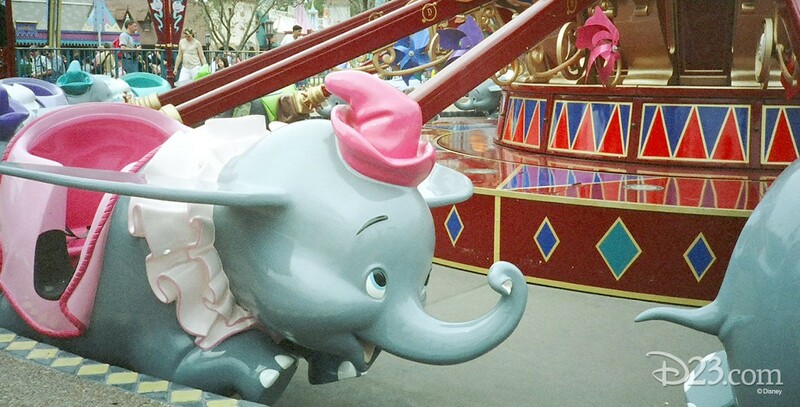 Totally remodeled in 1990 when new Dumbos and a new ride mechanism, which had been prepared for shipment to Euro Disneyland, were found not to be needed in France as early as expected. The attraction was installed at Disneyland instead and another new one was built for France. Also, a Fantasyland attraction in Magic Kingdom Park at Walt Disney World; opened October 1, 1971, and remodeled in 1993 and 2012 (increased to two carousels with interactive queue in a new location in Storybook Circus). A Tokyo Disneyland version opened April 15, 1983, one at Disneyland Paris on April 12, 1992, and one at Hong Kong Disneyland on September 12, 2005. A Dumbo the Flying Elephant attraction opened in Gardens of Imagination at Shanghai Disneyland on June 16, 2016, marking the first time the attraction appears in an area other than Fantasyland.